Made of import TPU, non -toxic, colorless, tasteless. You can experience unique fun Balls for yourselves. Suitable for all the family, you can play a variety of different games. Play with your friends, these are serious fun and will make you laugh while watching your friends fall over. Adopting non-toxic and odorless material, it is harmless to human health. It is usable for children as well as adult. The bumper ball is the greatest fun you can enjoy with your family or friends. And you'll fell like a wearable zorb ball when you put it on and don't worry about hurting yourself during bounce, flip, roll over and bump. Do not miss it and enjoy great day with your family and friends. High quality 0.8MM PVC, better sealed, non-toxic and odorless, relatively strong and durable, can be completely clean and reuse. 2 built-in handles for safety, 2 adjustable shoulder straps to adapt with different height of gamer. Foldable and easy transportation, the bumper ball can inflate or deflate with electric air pump (not included) in 30 seconds. Inner Diameter: 25.6 inch, Suitable Weight: 110~200lbs, Suitable Height: 5~6.2ft. Suitable people: kids (ages 8+), teenagers, students, office workers or outdoor enthusiasts. 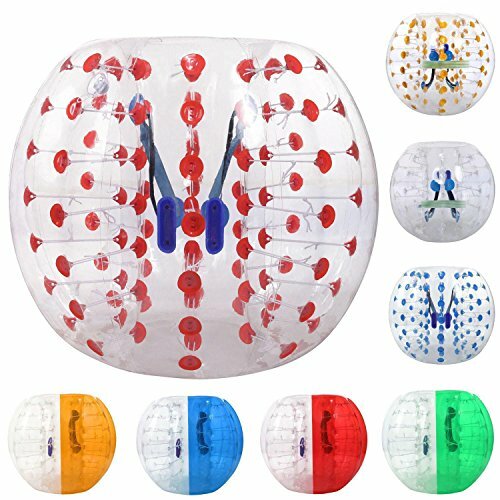 The Inflatable Bubble Ball Is suitable for family gatherings, picnic, birthday parties, barbecue, on the beach, in the park, or in own backyard. If you have any questions about this product by Bifast, contact us by completing and submitting the form below. If you are looking for a specif part number, please include it with your message.